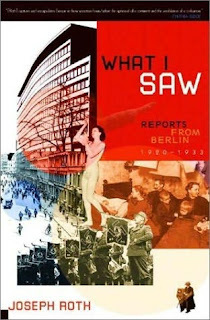 Not what I saw, but the wonderful selection of essays by Joseph Roth collected as What I Saw: Reports from Berlin 1920-1933. In this selection of "reports" by the novelist and journalist Joseph Roth, best known for his masterpiece The Radetzky March, we are presented with a picture of the Weimar Republic through the eyes of one of the finest writers of the twentieth century. Roth was a young foreign correspondent for various newspapers, only twenty-six years old, when the earliest of these pieces was written. During the period he would also write some of the novels that have brought him posthumous fame. The reports in this selection chronicle the underside of Berlin including Jewish immigrants, criminals and others. There are 34 pieces organized by topics such as Displaced Persons, Bourgeoisie and Bohemians, Berlin's Pleasure Industry and Look Back in Anger. In the essay "The Kurfurstendamm" he writes, "In the evening I walk along the Kurferstendamm. I slink along the walls like a dog. I am on my own, but I have a certain sense that destiny has me on a leash. . . . And so the Kurfurstendamm stretches out endlessly day and night. Also, it's being renovated. These two facts need to be emphasized, because of the way it's continually ceding particles of its true self to its designated cultural-historical role." "Let me say it loud and clear: The European mind is capitulating. It is capitulating out of weakness, out of sloth, out of apathy, out of lack of imagination . . . Now, as the smoke of our burned books rises into the sky, we German writers of Jewish descent must acknowledge above all that we have been defeated." The essays in this book ring loud and clear over the decades and they bring home to the twenty-first century a sense of the life and decay of the era witnessed by Joseph Roth. Today is the birth anniversary of Erich Wolfgang Korngold who was born in Czechoslovakia 111 years ago on this day. He was an amazing composer with a Piano Trio and Sonata for Violin and Piano completed by age 15. He would go on to compose operas, lieder, a Symphony, and concertos for both Piano and Violin. His opus 2 Sonata for Piano was championed by Artur Schnabel. He began composing for Hollywood at the request of Max Reinhardt in 1934 and in 1938 moved permanently due to the political changes in his homeland. His music was from the beginning the epitome of high romanticism and his film scores were some of the greatest for films like Anthony Adverse, The Adventures of Robin Hood, The Prince and the Pauper, The Sea Hawk, and Deception. He won two academy awards for his scores but in the late forties returned to "classical" music with the creation of such works as his Violin Concerto (premiered by Jascha Heifetz) and the Symphony in F#. I find Korngold's music invigorating in its intense harmonies and vigorous melodies. One of my favorite pastimes is browsing in used bookstores and, sometimes (often) buying good books. One of the best bookstores I have found is Bookworks on North Clark Street in Chicago (near Wrigley Field). The owners, Bob and Ronda, both friendly and knowledgeable, are welcoming to all. I've been going there for longer than I can remember and have fond memories of buying and selling (when I can part with a book) books over the years. Their offerings are of uniformly high quality especially for readers interested in good literature and I am seldom disappointed since I usually find something on my list. If they do not have the specific book for which I am looking there are always more fine alternate choices than my budget can afford. This time of the year they annually offer their books at sale prices making them even more attractive. 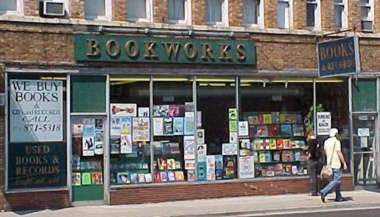 In the past I've taken my sister and her husband (also book lovers) to visit Bookworks when they are in Chicago and recommend it to my friends when they are looking for a good book. I can only conclude with the recommendation that all book lovers should visit Bookworks and partake of the fine wine of literature they offer. Continuing my reading of Protagoras I find myself questioning the nature of the dialogue itself. Is it a work of art? If the answer is yes, then does that effect the roles of the "performers"? After meeting Protagoras and engaging in some introductory discussion we are presented with a story and his argument that "virtue is teachable" in the form of a long speech by Protagoras (320d-328d). This is followed by questions from Socrates. 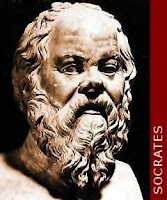 Interestingly, Socrates praises Protagoras' oratorical skills, but finds "one small obstacle" to the complete explication of the understanding of the "practice by which the good become good". Needless to say, this small obstacle becomes a major difficulty in going forward in the dialogue, when several paragraphs later Protagoras becomes frustrated with Socrates and refuses to limit the length of his answers in the "verbal contest" that is underway. This raises a further question in that the two performers have different agendas. Protagoras is interested in winning "the contest" while Socrates seems to be attempting to demonstrate the possibility (or impossibility) of teaching virtue or the good. This difference provides for real drama constituting a work of art. Some of the onlookers join the discussion providing suggestions and support for either side, while demonstrating their own respective characters. The dialogue is rejoined as new rules are agreed upon for continuing. The questions remain both whether progress toward determining the possibility of teaching the good and whether the audience will continue to revel in the challenge of the debate. One wonders also what Socrates young friend, Hippocrates, is learning from the artistic performance. Protagoras by Plato. Stanley Lombardo & Karen Bell, trans. Hackett Publishing, Indianapolis. 1992. An impressionistic masterpiece? A tragedy or a comedy? 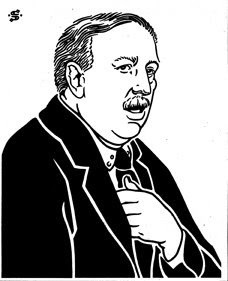 This novel, published in 1915, from the pen of Ford Madox Ford is unique enough to have been described by its critics as all of the preceding and more. Subtitled "A Tale of Passion", it is unique both in my experience and within the author's total work. The story is narrated by an American, John Dowell, who invites the reader to sit down with him beside the fire of his study to listen to the "saddest story" he has ever known. The story, set during the decade preceding the Great War, while sad for some of the participants is truly sad only in the ironic sense of the word. The characters are not particularly likable or sympathetic. Considering that, it is counter intuitive, but the reader is spurred on to read the novel by the precision and the beauty of the prose and the intrigue within the story. The narrative unfolds in a mosaic-like way with a traversal of the narrator's memory back and forth over the nine year period that is covered. When complete, the tale is ended perfectly much as it begins. The result is a beautiful small novel that ranks high in this reader's experience. The Good Soldier: A Tale of Passion by Ford Madox Ford. Everyman's Library, New York. 1991 (1915). It seems appropriate on the anniversary of Emily Dickinson’s funeral, held on this day in 1886, that I devote some brief comments in her memory. Having lived more than fifty-five years with hundreds of poems to her name, many on the subject of death, her life ended. The funeral went according to her wishes: a robe of white flannel, only a few of her closest friends and family attending the home service, the white casket taken by six of the family's Irish men servants out the back door, through the barn and across the fields to the family plot. At the service, Thomas Wentworth Higginson read one of Dickinson’s favorite poems, Emily Brontë’s "No Coward Soul is Mine"; sister Vinnie put a bunch of violets, two heliotropes and a pink orchid in the casket, for Emily "to take to Judge Lord." The famous "Called Back" epitaph on Dickinson’s second, current tombstone was chosen by niece Martha Dickinson Bianchi; Dickinson had enjoyed Hugh Conway’s popular novel Called Back, published a few years earlier, and she had used the phrase in her last letter. A writer to the end, we now continue to enjoy her poetic immortality. without oppress of toll;How frugal is the chariotThat bears a human soul! It is difficult to decide what to say upon reading The Pensees of Blaise Pascal. 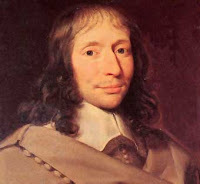 The fragments, some resembling aphorisms with a few extending to several pages of prose, were left disorganized and unedited at Pascal's death. Readers have pondered over The Pensees (literally thoughts) ever since trying to interpret them and discern some semblance of a world view from them. In my reading I also tried to comprehend the fragmentary comments and found the views of Monsieur Pascal, to the extent that I understand them, to be foreign to my own views of life. For Pascal the human condition is wretched with man's reason a frail thing on which life ultimately cannot depend. The overwhelming importance of such concepts as immortality and original sin imbue his world view with a supernatural and other-worldly outlook that is difficult to reconcile with reality. Perhaps his personal physical ailments were the source of his view that man in general shared his hatred of the human body. Of the many thinkers who have contemplated Pascal over the years since his Pensees were left to us in 1670, Voltaire expresses thoughts close to my own when he says, "Nature does not make us unhappy all the time. Pascal always speaks like a sick man who wants the entire world to suffer. "(Philosophical Letters, "Twenty-fifth Letter, On Mr. Pascal's Pensees"). For Pascal unhappiness is our lot, the corruption of the body is complete and irredeemable, self esteem is to be abhorred, god's thoughts are impenetrable and yet, we would be better off if we accept the wager that he does exist. Well I, for one, neither accept Mr. Pascal's worldview nor his wager. I look forward to continued wonder at the mysteries of existence and I celebrate the continuing progress that, weak as we may be, we humans produce with our reason. Pensees and other writings by Blaise Pascal. Oxford University Press, New York. 1995. While the title of Doris Lessing's early novel, published in 1950, sounds rather lyrical the story is anything but that. This is the story of Mary and Richard Turner, who farm the land in South Africa in the forties when apartheid is the rule. Mary is an intelligent woman who makes a a fateful choice in Richard for her husband. Living with Richard, who is ineffectual and unsuited to the life of farming, soon leads Mary to depression. She grows progressively bitter and takes her frustration out on the black servants that help run the farm. In spite of the darkness of the story, a tragedy that verges close to melodrama, the writing of the author in her first novel is lucid and imaginative. Lessing plumbs the psychology of Mary's depression and her marriage with Richard effectively, building suspense all the while even though the reader knows the outcome from the first page. It is the prose of Doris Lessing and the clarity of the structure of her novel that makes this one of the best first novels that I have ever read. Chicago is fortunate to have many fine theater companies. Last night I attended a production of Macbeth by one of those companies, Greasy Joan and Co. Their production of Macbeth, directed by Julieane Ehre, was performed in contemporary dress with a simple but effective stage representing "a fantastical world of 'the future'". 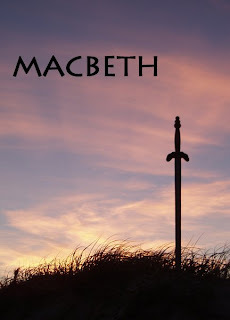 The emphasis was on the growth of tyrannical power, and as the evening wore on and the murders accumulated the power of Macbeth seemed to increase, that is until the denouement when he and his power collapse quickly with the suicide of Lady Macbeth and his death. While the acting of the leads was effective, all of the parts of the play did not seem to cohere. The emphasis on the tyranny and brute force overshadowed the impact of the psychological forces at work, while the omnipresent spirits/witches were difficult to reconcile with the futuristic setting of the tale. In spite of this there were some impressive moments of theater, especially the scene with Banquo's ghost that effectively opened the second part of the performance. Overall it was an engaging evening of theater with a somewhat flawed performance of one of the greatest tragedies in the repertoire. Macbeth by William Shakespeare. 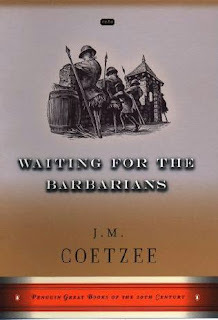 Performed by Greasy Joan & Co.
A visionary novel by J. M. Coetzee, Waiting for the Barbarians is challenging with a lucid style and deceptive simplicity. It is an allegory of a place that seems familiar yet cannot be identified with any specificity. The protagonist, known as the Magistrate of the local outpost of the Empire, tells a story of the Barbarians poised on the edge of the Empire waiting. The story suggests conflict, yet there are no battle scenes. The Empire seems as amorphous as the threat from the Barbarians. There are even moments that seem Kafkaesque in their sheer surrealness. The primary details of the story center on the relationship between the Magistrate and a young blind girl, a barbarian who begs for her survival. The Magistrate takes her in and the relationship that develops between them mirrors the growing dissatisfaction of the Magistrate with the Empire. He eventually takes action that will have significant consequences for his life, leading to lessons about freedom, justice, and the meaning of life within the Empire. The climax of the novel is powerful in the sense that principles are powerful in the lives of humans. The allegory is effective and the story is masterful. It is not surprising that Coetzee won the Booker Prize for this novel. In spite of the title of this retrospective collection of essays, Opera and the Morbidity of Music by Joseph Kerman, the author presents a forceful and eloquent argument that opera and classical music in general is neither morbid nor moribund. He is successful through nuanced and informed writing and the use of a structure in which a group of musical themes is highlighted much like those of a Bach fugue. Kerman quotes Charles Rosen, " It is never the theme that is the central interest but the way the theme is embedded in the polyphonic structure" (p. 81). Thus the essays take on this aspect of music and in doing so become more than their individual essayist parts. There is an ebb and flow to the collection that charmed this reader with references to musical memories and suggestions for future listening and reading. The breadth of the essays spans centuries of music and multiplicities of musical form while frequently narrowing the focus to specific composers. Over the course of thirty essays covering both the familiar (Bach, Beethoven, Mozart, Wagner) and the unfamiliar (Byrd, Monteverdi and program notes), the life of music is reviewed from baroque to the present. The whole is lively and intelligent, both informative and accessible for the general reader. Opera and the Morbidity of Music by Joseph Kerman. New York Review Books, 2008.